With this in mind, I started forming a plan of attack and prayed that this road trip would be memorable, in a good way. 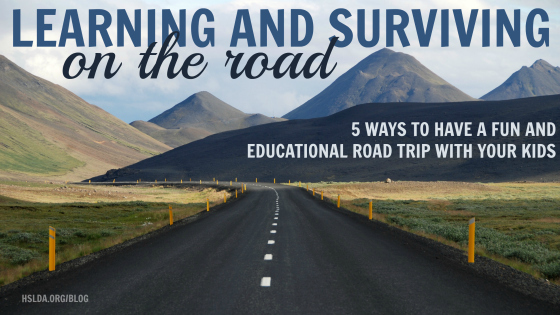 First off, I think road trips are fantastic ways to integrate some extra learning. We always keep learning on the road simple and fun. 1. As a book lover, one of my favorite things to do is go to the library and get books about the places we visit and the things we see and do. Our trip took us to the Fort Worth Stockyards, so we got some picture books about cowboys. Our favorite one was a funny cowboy version of the Cinderella story. We also went to the Alamo and we found a great book detailing the history of that place and highlighting all the main characters. On a previous trip to Dallas, we visited Dealey Plaza. It was perfect timing because my oldest daughter was studying the presidents and she was really excited to read books about Kennedy and then be able to see where he was assassinated. We also get library books and audio books that are just for fun. 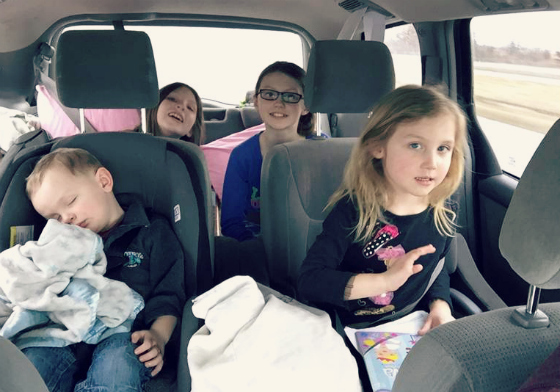 I have to admit that since my minivan is a black hole for all kinds of items, especially library books, it is with some level of fear and trepidation that I let them on board. But the risk is usually worth it since those blessed books help to kill a few hours on the road. Because of the length of the drive I also scoured the internet for other ideas on how to keep kids happy and occupied in the car. Although I have definitely used the DVD player on road trips, I was hoping to spend a lot of time unplugged if possible. Of the websites I browsed I thought this one had the best summary of helpful ideas. 2. 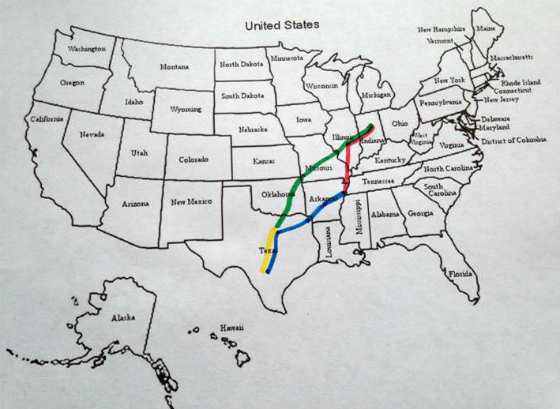 I printed off a black and white map of the United States for each child and colored each leg of our trip a different color. Other than the fact that they got a little bit of candy every hour, the kids loved seeing the gummy bears being depleted (because that meant we were closer to our destination). It was a great visual for them to quickly see how much farther we had to go. I think this greatly cut down on the dreaded are-we-there-yet question. 3. I also prepared some very simple crafts/activities stapled inside numbered, brown bags. I am not a craft person! So, trust me, they were simple! The kids got to open a brown bag at certain strategic cities (like: “Okay kids, here we are in Texarkana! You can open Bag #5!”) No more than $1.50 per child was spent on any one craft or activity. These bags contained things like dollar-store craft packets, pipe cleaners to bend into creative objects, small containers of play dough to mold, Mad Libs and other simple games printed off the internet, etc. I even used some things we already owned, like some Ed Emberley how-to-draw books. Twice, when it was a more basic activity, I included a fun snack that they wouldn’t normally get at home. These bags took less than two hours to prepare and were a huge hit. I think this was because of the element of surprise and also the fact that they got to open something every few hours, like they were at a never-ending birthday party or something. 5. The License Plate Game, with this awesome print out. Yes, we actually saw Hawaii and Alaska (twice!). We saw the District of Columbia too, which got left off of the print out. In fact, we only missed seeing Wyoming and a handful of New England states. This game kept the kids looking out their windows, which I loved. Plus, searching for license plates and coloring in the states on their map was a helpful U.S. geography review! Because of these simple activities, I was definitely able to enjoy the journey more and not just wish the time away. And according to my seven-year-old, who loves candy more than anyone else, the drive was actually the best part of the trip for her. If you are planning to hit the road in the coming months, I wish you good luck, fun learning, and happy memories! Hopefully you will enjoy the journey as well as the destination. Photo Credit: First photo graphic design by Charity Klicka; second and third photos taken by Amy Koons, edited by Charity Klicka.